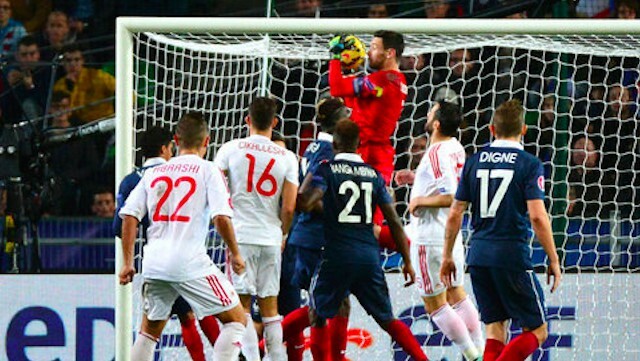 France’s two forwards, Karim Benzema (Real Madrid) and Alexandre Lacazette (Olympique Lyonnais) weren’t able to score and show that Didier Deschamps was right to try a new 4-4-2 tactic versus a well organised wall of at least six Albanian defenders. The french team having several of their key players in the physio room, gave a chance to some newcomers to shine, but they weren’t able to show that they had a rightful place on the pitch. Captain Cana’s Albanian teammates, showed that winning against Portugal away and draw with Danemark wasn’t luck, but a good defensive scheme, great motivation and some well timed counter-attacking. After a good first half and a goal, they had more problems to deal with the french 4-2-3-1of the second period and gave up after Griezmann’s goal. Hugo Lloris MOTM: 6,5 :Tottenham’s GK was his usual self; very concentrated,made some good saves and kept the score one down till the end of the game. Couldn’t do much about the albanian goal. Christophe Jallet : 5 The Lyonnais player had a very bad first half; he made several defensive errors and was responsable for the Albanian goal. The second period was better and gave the assist for the french equalizer. Raphaël Varane: 6 He’s so young, yet so consistent ! In Spain, he’s called “Mr Clean” and that’s what he is. Good game from the youngster, but he can do a lot better. Mapou Yanga- M’Biwa : 4,5 He’s just not good enough (at least for now) to play with the first team. He gave his best, but it wasn’t enough. Lucas Digne : 5 The Parisian player, didn’t convince; having no direct opponent, one could expect from him at least some crosses or even more, but sadly he produced a very average game. Yohan Cabaye : 4 What’s going on with the former brilliant Newcastle’s player ? Since his arrival to Paris he’s just became someone else! No serious mistakes but he just isn’t able to produce good football. Moussa Sissoko : 4,5 Serious player, but he didn’t propose solutions for the team and his offensive contribution, was very limited. Paul Pogba : 5 He was average; it’s not easy to put only 5 for a player of his talent, but he did nothing extraordinary during this game; he even was responsable for the Albanian goal. He should get involved more and be part of the team, soloists have a place in an Opera theatre not on football game. Mathieu Valbuena : 5,5 It wasn’t an easy game for “petit vélo” ; his Albanian bodyguard was big, strong and very much present; nevertheless, the former Marseillais, showed good will, but he should pass the ball quickly and not try to keep it, as he did yesterday. 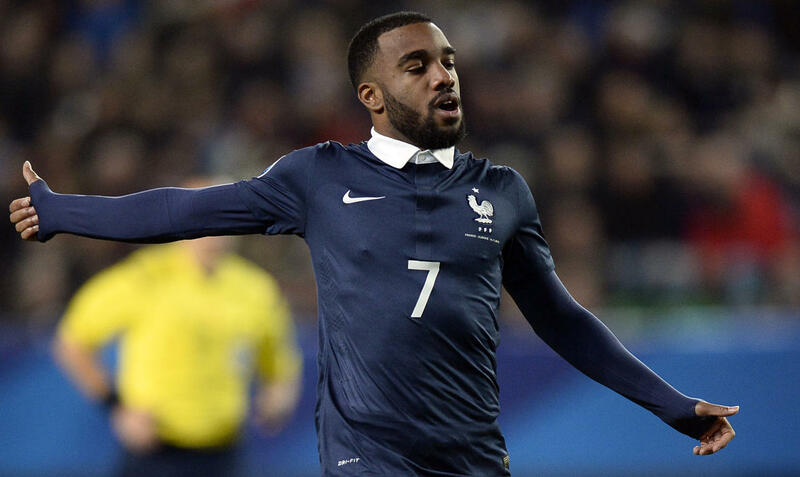 Alexandre Lacazette : is Ligue 1 easier to face ? Alexandre Lacazette: 3,5 Was he stressed by the media and the fans expectations? The young Lyonnais is currently the number 1 goalscorer of Ligue 1 with 11 goals, but he just wasn’t good enough; playing for the first time with Benzema, wasn’t easy, but at least he did try. Karim Benzema : 5 Is it possible for a player who shines with Real Madrid to be quite insignificant with the national team? Apparently yes ! Supporters have the right to expect more, but for the moment it’s less. Only one question: WHY ? Antoine Griezmann MOTM : 6,5 His entrance in the game, changed everything; he brought movement, speed and a very nice goal, wich saved France’s blushes. ‹ To Boo or not To Boo : That’s the Question !